This iconic Palm Springs vacation home is completely updated with great attention to detail and respect to its midcentury modern architecture. An ideal open floor plan wraps around the pool, providing a view of the pool and mountain backdrop from almost every room. True to its iconic Palm Springs midcentury heritage this home features a disappearing wall of glass that opens the living space to the wonderful outdoors, creating an effortless flow in and out of the house for the ultimate vacation experience. This Palm Springs vacation getaway boasts a beautiful indoor/outdoor setting. Featuring a walled and gated yard with a stunning private pool and a built-in water feature, an outdoor gas fire pit, a natural gas BBQ grill, 6 chaise lounge chairs and plenty of outdoor sitting areas for outdoor conversation and relaxation. This Palm Springs vacation home has a beautiful private backyard perfect for lounging in the sun or casual dining by the pool with family and friends. Entertain friends and family or prepare a quiet dinner in a beautiful, renovated, fully stocked kitchen with new Stainless steel appliances, side-by-side fridge, gas stove, and marble counter-tops. The open floor plan creates a great atmosphere in this modern cook's dream-kitchen. The living room in this Palm Springs vacation rental features a 60"" HDTV with DVR and Roku's. A SONOS integrated music system gives you free access to Internet radio, Pandora and can also be synced to your ipod, iphone or ipad. The large master suite has a King size bed and 40"" HDTV with Roku. A large slider offers direct access to the pool and breathtaking mountain views. The master suite has its own bathroom completely upgraded with amazing attention to detail. Two more spacious bedrooms (one with en-suite bath) are comfortable and stylishly appointed with queen size beds and a 40"" HDTV in one and a 32"" HDTV in the other, both are furnished with HD Cable. Located in the desirable neighborhood of Warm Sands, this Palm Springs vacation home is 5 minutes from the heart of Downtown Palm Springs. 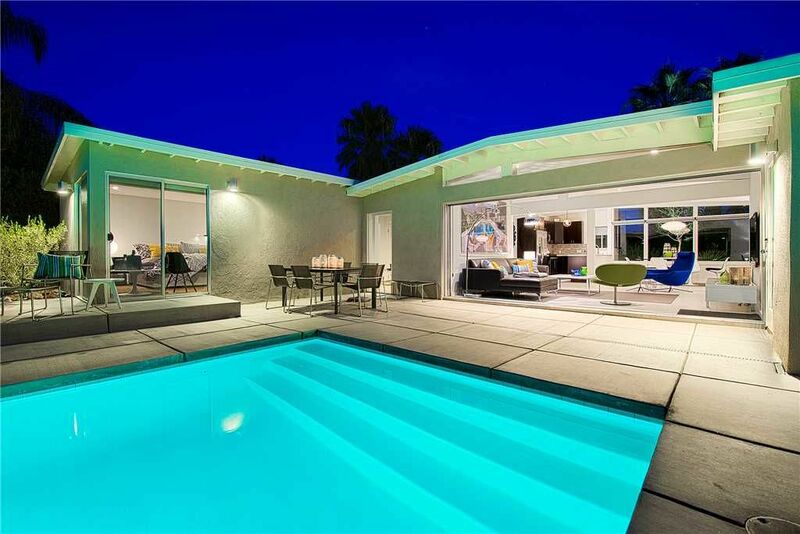 This iconic mid century Palm Springs home for rent is within a short 10 minute walk to shopping and great restaurants. You can enjoy the great wide-open spaces of the unique desert paradise of Palm Springs or just lounge at the pool with spectacular views of the surrounding Palm Springs Mountains! Perfect Coachella Stay in Palm Springs This home was simply perfect for our group. It was spacious with beautifully appointed furniture and artwork. The pool was warm and inviting, especially with the living room wall that opens to the backyard. This home made our Coachella experience even better. The great outdoors. A lovely desert retreat with excellent outdoor facilities. Downtown Palm Springs walkable if not too hot!! Well equipped kitchen , quiet area and great views. Stylish perfection I am a loyal fan to both Vacation Palm Springs and to this property. Everything was perfect, from the customer service to the location, amenities, cleanliness, and comfort of the property. House was tastefully & thoughtfully decorated & well-equipped for a family vacation, down to the details. Enjoyed the classic MCM design mixed with modern services & features. Wifi, TVs, art, furniture, pool, window treatments, etc. Great location to downtown PS. Reservation team was communicative & available, & reached out to us when we were running late to our arrival. They followed up after our check in & responded to our one and only small service request. Immaculate home in an ideal location. Nicely stocked kitchen. Really enjoyed the great service and attentiveness from the Vacation Palm Springs team. I interacted at different points with Bunnie, Britt and Shawn -- and all of them were exceedingly helpful. Thank you!!! The villa fitments , the quality , the attention to detail. The swimming pool area. The sonos system .